Nintendo really needed Super Mario Party to be good. While the Nintendo Switch console has been selling like wildfire for the past 18 months, many of the tentpole releases we were waiting for – Breath of the Wild, Super Mario Odyssey, Splatoon 2 – have come and gone, and there’s a lot of pressure to keep up the console’s early momentum. Super Mario Party might be the game to do just that, and feels as much a refresh as it is a tightening of the series’ well-worn mechanics. As a multiplayer party game, Super Mario Party won’t be a necessary purchase for a lot of players, but for couch-based co-op and casual minigame fare, this looks like exactly the game the Switch needed. So what exactly have Nintendo done differently, if anything? We've run through our thoughts in our review-in-progress below. There have been a lot of Mario Party games now. Super Mario Party is technically the 11th for a mainline console – and the first not to use a numbering system – though there have been a handful of DS entries along the way too. Most similar titles see criticism for re-using the same repetitive board game mechanics, and in a console generation that saw complete overhauls of traditional Zelda and Mario game design, that wouldn’t have been good enough. This is still a Mario Party game though, and most of the action takes place on 3D boards, with a host of Mario characters rolling dice, playing mini-games, and collecting stars to try and crown themselves the best of them all. Think Mario Kart, but you’re all playing some kind of in-house, home-brew family Monopoly. There's a host of secrets on each board, like a melting ice cream cone or ticking Bob-ombs that shake things up if you land on the right spaces enough times – and unprompted visits from Mario baddies that add more risk to landing on random spaces. These alone are an incentive to revisit old boards or play out a full 20 turns instead of a mere five or 10, and as always it’s the combination of chance and strategy that makes Super Mario Party so enjoyable to play. Mario Party 9 and 10 lost a lot of the series’ competitive streak in main board mode, which packed all four players together in a single cart that was pulled around the map, rather than letting each player roam for themselves. Super Mario Party wisely goes back to the old formula here, along with a host of new tactical elements that expand the possibilities for gameplay. Anyone familiar with previous games will see a number of entirely new faces for the series, including Boo, Goomba, Koopa Troopa, Hammer Bro, Dry Bones, Shy Guy, Diddy Kong, Monty Mole, Pom Pom, and Bowser Jr – as well as the big man Bowser himself, previously only playable in Mario Party 10’s ‘Bowser Mode’, but now able to walk the boards like the rest of them. You can collect ‘support’ characters along the way, which act a bit like Assist Trophies from Super Smash Bros – but instead of attacking other characters, they add their own die to your roll each turn, stacking up the numbers and often saving you from a low roll, or making you overshoot the nearby space you wanted. The 2v2 Partner Party mode goes one step further, ditching the restrictive one-way board for an open map you can roam in any direction you please. It allows for far more strategy in your movements each turn, not least because you share turns with your teammate, and need to communicate to make sure you make the most of the stars, items, and surprises of each board. It’s not just a different mode, though - it’s a smarter one, and one that will keep bringing back adult players who have tired of the simple formula of the games’ main Party Modes. The competitive play has really been focused, with enough feel-good charm to still make you feel like you’re all in it together. Players have the option of high-fiving each other at the end of each minigame for a reward of +3 coins, which makes even breezy minigames feel like triumphant team efforts. The once-infamous cart from the last two games, however, lives on in spirit in the River Survival mode, which puts four players in a raft, plunging down rapids and playing minigames to extend how much time they have left to reach the end. Naturally this requires everyone to paddle somewhat cooperatively – in a smart use of the Joy-Con’s motion controls – and the various twist and turns to the finish line give it plenty of replay value. And we haven’t even touched on the mini-games. In usual Mario Party style, there’s a whole new 80 minigames created just for the Nintendo Switch system - with the promise of more unspecified content if you manage to access them all from the main game mode. Many will feel… familiar to fans of the franchise, as they use the same randomized selection and 1v3, 2v2, 4v4 formulas to try and out-mash, out-smart, and out-collect your opponents. Few are truly difficult, but the short and combative nature of most of them keeps tension high, and the selection is smart enough to utilize the specific strengths of the Joy-Con controllers. The HD rumble makes for tense balloon competitions, while the motion controls allow you to reel in nets, operate wind machines, and high-five each other in intuitive but surprising ways. This is the first Mario Party game to offer online play, in a dedicated ‘Online Mario-thon’ mode that connects you with players around the world. It does, however, only extend to the minigames, allowing you to play a best-of-five with strangers online and compete for the top spot on various leaderboards. For a multiplayer game that doesn’t seem like much, especially since the Nintendo Switch Online paid service has just launched, and more could have been done here. But playing 20-turn board game with online matchmaking would also bring its own problems, which we don’t entirely blame Nintendo for avoiding: what’s the incentive to stay online with a stranger if it’s clear you’re losing halfway in? Much has been made of the Toad’s Rec Room mode, which lets you pair up two Nintendo Switch screens for a number of compatible mini-games. Cue 2v2 tank combat that shoot cannons from one screen to another, or halved pieces of fruit that need to be reconnected. It’s fiercely fun and makes the most of the console’s capabilities, even if it requires you to have two $300 systems to hand. Super Mario Party feels like exactly the party game the Nintendo Switch needed. While online features are sadly limited, there’s a host of different modes all offering a unique take on the Mario Party formula, and gamers of all ages and abilities should find something here for them – just as a Nintendo game should be. 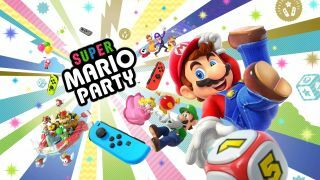 We'll update this review going forward, but so far the added strategic elements and wide range of gameplay modes make this, perhaps more than any other, a Mario Party game for everyone.